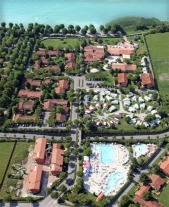 This is a holiday village beside the town of Sirmione on the beautiful Lake Garda. Typically groups stay in 4 bed bungalows with bathroom, kitchen, living room and terrace. There is a good quality restaurant, 3 cafés and an on-site shop. The main swimming pool, childrens' pool and jacuzzi are all open from mid-May through to October. In addition, there are tennis courts, basketball and five-a-side football courts, mini-golf and direct access to the beach on Lake Garda.